300 Win Mag Ballistics – Ideal 500 Yard Big Game Cartridge? The 300 Winchester Magnum is an accurate, very popular 30 Cal Magnum cartridge used by many big game hunters and even long range benchrest shooters. Hunters in both North America and Africa have successfully used the 300 Winchester Magnum to down game animals of all sizes and at extended ranges. The ability to push heavy 30 Cal diameter bullets (i.e. 180grs and above) at high velocity (3140fps for the 180gr) allows for flatter bullet trajectory and higher retained bullet energy on elk sized game out to 500 yards. Excellent ballistics and the case is designed to fit a standard length action. 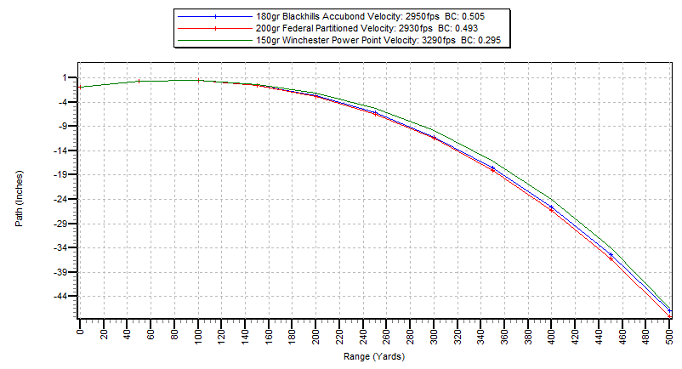 The trajectory graph below shows 3 x 300 Win Magnum factory loads zeroed to 240 yards. 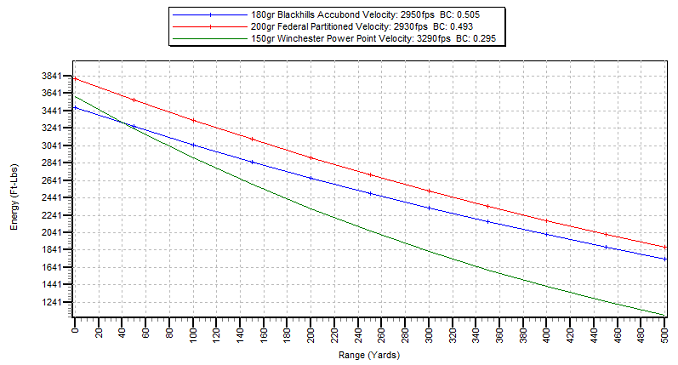 Average Point Blank Range of all 3 factory loads (using a 6 inch vital zone) is 290 yards. Only 1.72 Inches difference in bullet path between the 200gr and 150gr bullet. This is simply amazing ballistics performance considering the bullet weight difference is 50grs! You could use any one of these loads under field conditions and not notice any difference – they are virtually the same. 300 Win Magnum – Ideal 500 Yard Big Game Cartridge? Notice the green line in the energy graph above? This is the 150gr load. The energy lost is significantly greater at this range than the 180gr and 200gr bullets. Approximately 750ft-lbs. What can we conclude from this? The 150gr has ideal ballistics for long range shots at deer the size of whitetail and mule, not big game like elk where energy is lacking at such extended range. The 180gr and 200gr bullet fired from the 300 Win Mag produce the required ballistics performance to down big game the size of elk out to 500 yards. Flat shooting, fat 30 cal diameter heavy bullets and lots of energy left at 500 yards – the perfect combination!! This simple ballistics analysis of the 300 Win Magnum tells us it is indeed suitable in cleanly bringing down big game way out to 500 yards if necessary. What did we learn from this simple ballistics analysis? To get the most from this magnum cartridge, you need to know 300 Win Mag ballistics. It does not matter if you shoot factory 300 Win Mag ammo or reload for the 300 Win Mag, its essential to use ballistics software like Shoot! to calculate the optimum sight settings to take full advantage of 300 Win Mag ballistics. Analyze dozens of factory loads and bullets for the 300 Winchester Magnum using Shoot! ballistics app/software so you know the optimum trajectory/energy for any given load and determine which ammo/bullet combination gives the best performance.